Almost everyone I know loves pasta and its popularity has put it on the top-ten favorite food list for years. Pasta is inexpensive and versatile…both attributes that makes it a household staple like flour, sugar and eggs. Plain spaghetti, lasagna, egg noodles, shells and macaroni were probably the only kinds of dried pasta sold in the Midwest when I was growing up…none of those products were referred to as pasta back then…and none of them were fixed al dente, either! Those two words remind me of the time my husband and I were newlyweds and ate at an upscale restaurant. I called our waiter back to the table to complain that the green beans were not cooked enough…he informed me that they were supposed to be that way which was al dente. He also said he could take them back and have them over-cooked if that was the way I liked them. Being young and slightly intimidated, I proceeded to chew my way through those horrible beans. I now know, however, that those beans were not cooked past the raw stage as they should have been…so, I was correct that they were underdone. The conchiglioni, or large shells, are fun to work with. A box of them can be cooked quickly and stuffed with many different combinations of meats, cheeses and vegetables. 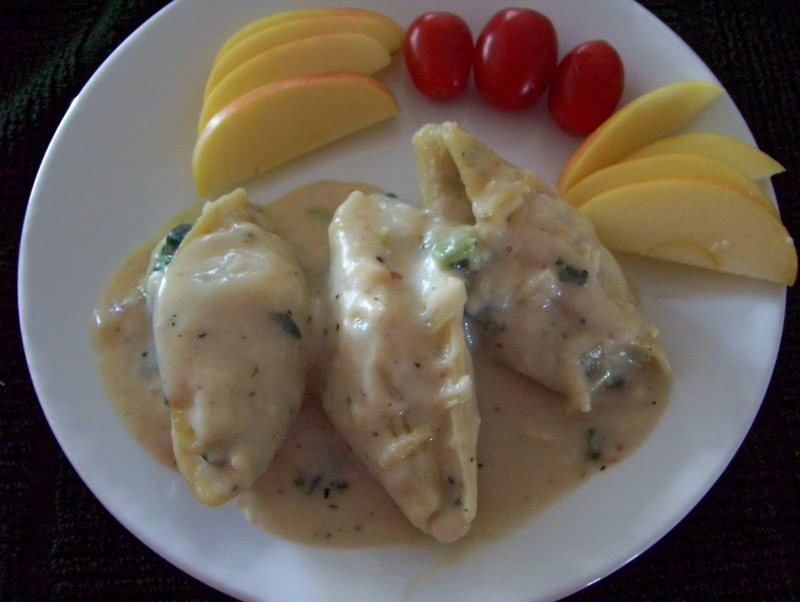 Today’s recipe uses large shells filled with a delicious vegetable mixture. This dish also features a wonderful, creamy sauce that is sure to get rave reviews from family and friends. This lovely meal is even better the second day! Cook macaroni shells according to the package directions. Drain. Cook celery and onion in hot oil until tender but not brown. Remove with slotted spoon to a bowl, set pan aside. Combine onion mixture, cottage cheese, cooked, drained spinach, egg, salt, oregano and pepper. Mix well. Fill shells with mixture. 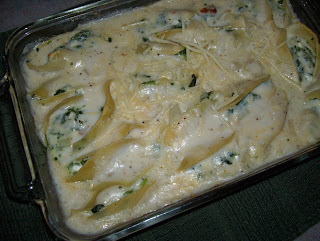 Pour half the cheese sauce* (recipe below) into 8x11 1/2 inch baking dish. Arrange stuffed macaroni shells in sauce. Bake, covered at 375 degrees for 15 min. Drizzle on remaining cheese sauce. Bake, uncovered, 10 min. more. Sprinkle with additional Parmesan cheese if desired. Serves 5-6. In pan that was set aside, cook 2 T coarsely chopped onions; blend in 3 T flour, ¼ tsp salt and dash of pepper. Stir in 1 ½ C milk and ¾ C chicken broth. Cook and stir till the sauce is thickened and bubbly. Stir in ¼ C grated Parmesan cheese. 166. Calzone, Delicious and Pronounced Correctly!